My reef aquarium has had its own web page — Scott's Reef Aquarium Home Page — devoted to it for about eleven years. It was the first web page I ever published, and it's been out there a long time. It's been in Google, Yahoo and MSN searches for a long, long time. I've been counting page hits to the page since that time and have about 19,000 total page hits to date. So, it's sort of "established." I get, on average, about 30 hits a day, equating to about 30 unique visitors a day. 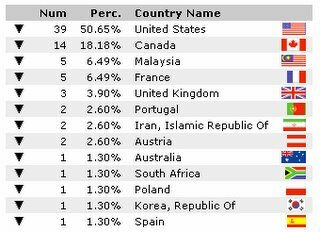 One of my conclusions is that since people are searching for genus/species names in Latin, the web page is relatively "language agnostic", accounting for the larger number of international hits on this page than on my blog page. Here is a breakdown of the countries hitting the page.